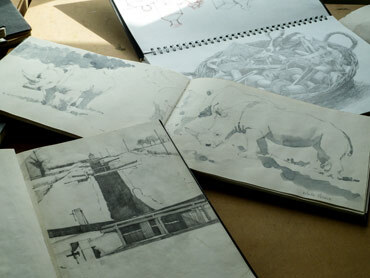 Sketchbooks are my memories and when I draw I clarify my ideas and record what I see. 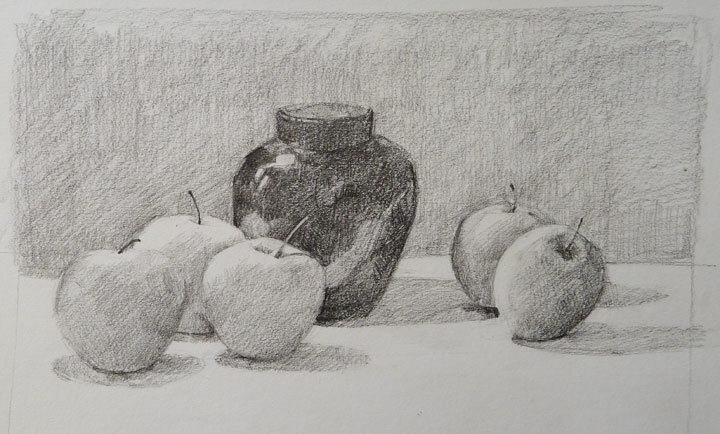 I’m never sure what theme will inspire my next pieces of work so drawing and carefully observing is essential to me. 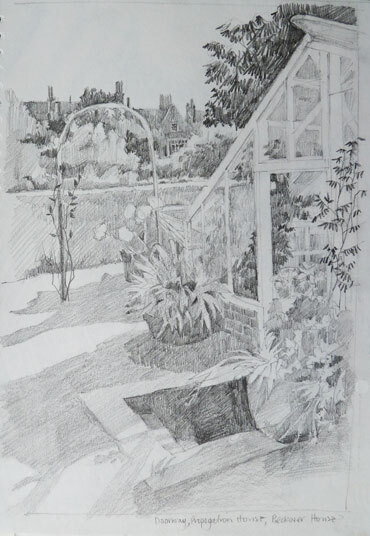 I look for challenging things and places to get involved with the light, colour patterns and texture as I draw. The core of my work is building and landscape. I often work in a series. 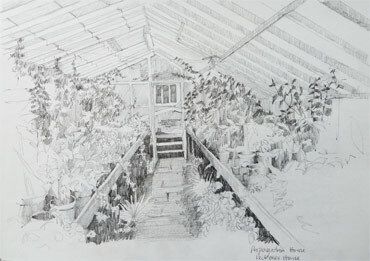 I did a lot of drawings of conservatories including the Orangery at Peckover House. 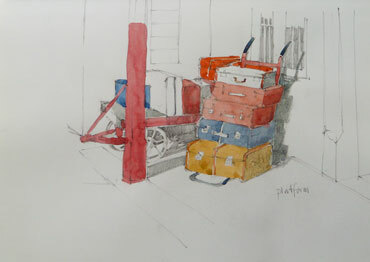 I still draw landscape and flowers and I like also places with challenging shapes and complicated and powerful pieces of machinery such as the Great Central Railway museum at Loughborough. More often than not - even in a beautiful house or garden - it can be the details in everyday things that attracts me to draw it; crumbling stonework or discarded working tools or materials. 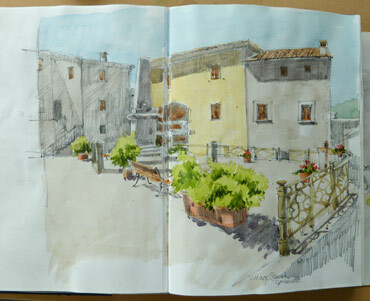 Sketchbooks by Mary Rodgers. A drawing of Foxton Locks is in the foreground. My work in sketchbooks started to grow seriously when I did a series of drawings of Foxton Locks some years ago. 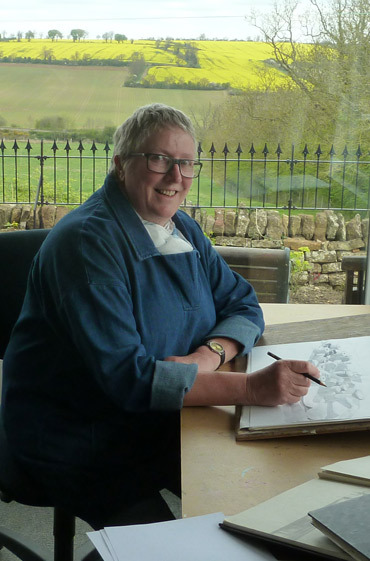 I started at the bottom of the locks, in the basin, instead of at the top where people usually go, and gradually worked the way up the locks with my sketchbooks, drawing in all sorts of weathers including snow. I keep a number of sketchbooks on the go the same time. I have several in my studio, one in the house and one in the car so that I can draw at any time. I pick up one that’s the size I need and work on any page. I keep things simple when I go out to draw. Everything fits into a flat rectangular bag and that‘s all I need. I always take a smallish piece of hardboard when I draw outside, with my sketchbook held on with bulldog clips. 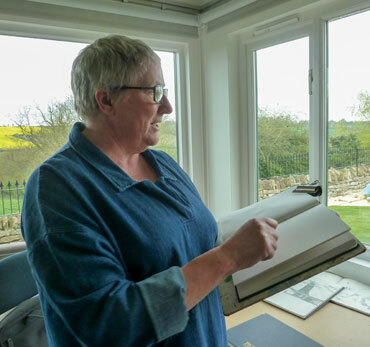 It’s comfortable to hold and I can keep drawing and concentrating, and holds the landscape style sketchbooks which I like to work in. 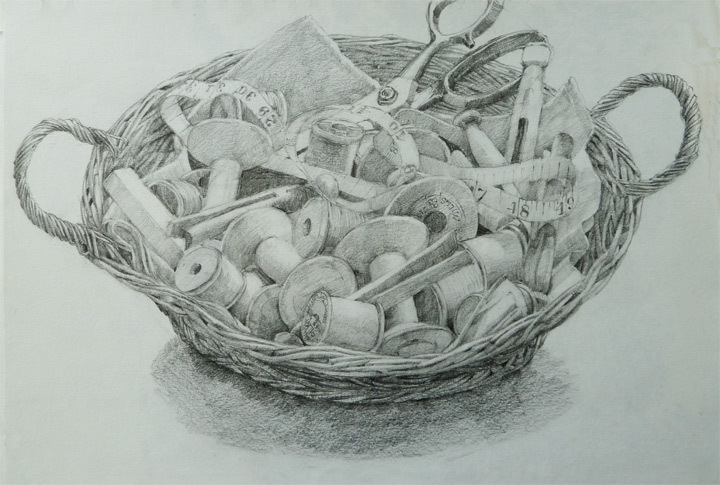 I take pencils – always a 4B – and when I’m out I use a sharpener because they are accepted everywhere. If I want colour I take my large folding metal watercolour palette with a few colours already squeezed out, plus a handful tubes of my main colours and brushes. Often I will add a colour wash when I come back in to remind me of some of the colours, and I take a lot of photographs for colour reference. My thoughts and notes go into a separate sketchbook. Like a diary, I write in it every day. Ideas, information about where I was drawing, what the weather was like, articles and the occasional drawing all find their place here. I use the references in the diary and match it to the recorded dates on my digital photographs. 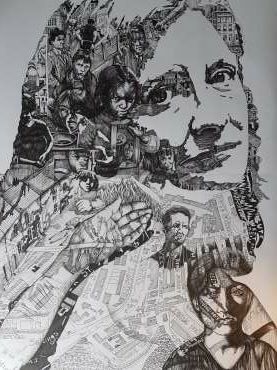 I usually work from the centre out and keep the drawing going. The outside edge develops as I draw, and if there is not enough paper I will stick some onto the edge to allow the drawing to grow. I concentrate first on one small area, thinking about its proportions and drawing it the size that feels right in my sketchbook. Then I draw adjacent areas. I keep searching out patterns of interlocking shapes. 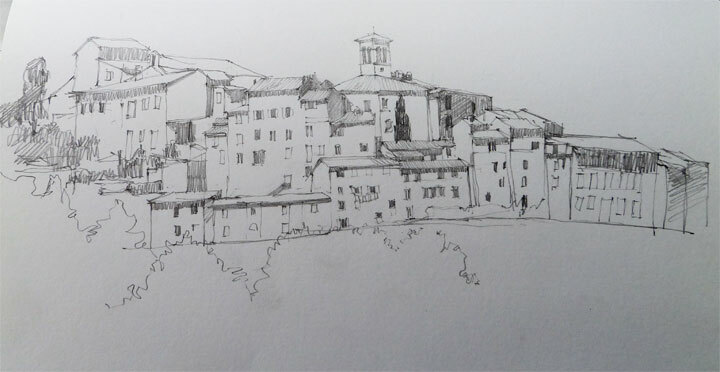 I always explore any new place or idea by sketching first so I also use my sketchbooks for making detailed drawings. I put on the radio or some music on in my studio and get totally lost in the drawing. 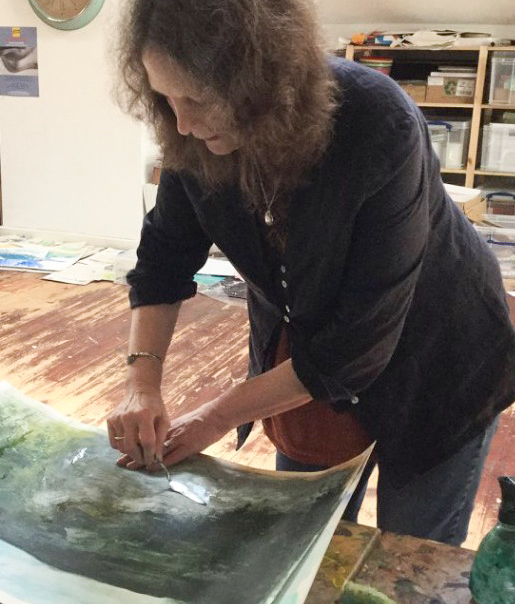 The process of drawing, preparing a painting and sorting through the techniques is as enjoyable as the result and it is doubly satisfying when someone else enjoys my work as well. Beautiful! I love to see sketchbooks and thought processes like this. Beautiful, thank you for letting us see these. I hope it will encourage me to take my sketchbook out with me more. Lovely drawings Mary. Thanks for taking the time to share them.